“Warriors” is the saga of four clans of cats, living in the wild, adhering to what they call (mew?) “the warrior code.” The cats hunt prey, patrol their territory, mentor their apprentices, take care of their elders and try to keep the fragile peace amongst the four clans. There are many skirmishes with rival clans and outside threats (dogs, badgers, foxes), as well as intrigue and drama within the clan. Into the mix comes a nearby housecat (sneeringly referred to as a “kittypet”) named Rusty, who was caught hunting mice in Thunder Clan territory and then is invited to join the clan. Rusty becomes Firepaw (his apprentice name), and later Fireheart (his warrior name). When I noticed my sister and brother-in-law (aka Mr. and Mrs. Incredible) reading the Warriors books too, I was really intrigued. 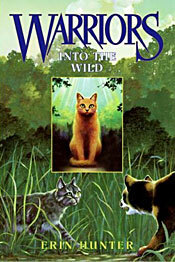 So I read the first one, “Into the Wild” where Rusty becomes Firepaw and tries to live up to the clan’s expectation while being thwarted by a power-hungry cat nemesis named Tigerclaw. I ended up reading all six books in the series. I just had to know what was going to happen to our hero and his clan. I can read one in less than two hours. They are all 200+ pages long, but the typesetting is very big and open. Dash, who is 8, had no problem finishing one after the other. Then I read the second series, “Warriors: The New Prophecy”, where the next generation of apprentices play the starring role. Another six books with an interesting environmental underpinning. There’s a third series, and the only thing preventing me from reading it is that I feel a little embarassed about reading 18 books meant for young kids. Duration of activity:I can read one book in less than two hours; maybe double that for kids? Cost: $6.99 per paperback, but you might as well buy the whole set, which is $24.41 at Amazon. They also had them at the library here. Child/aunt fun ratio: 55/45. Kids will enjoy them a little more because they won’t overanalyze them and they don’t have the embarassment factor of reading a kids book. Wow – what a wonderful blog. I am not a big blog reader, but I stumbled across yours about the Warrior Cats which my granddaughter reads with passion. She can hardly wait for whatever new release is in her future. Think the next one is September 2…didn’t see anything for August. I agree that reading in the restaurant is okay. My granddaughter has been pushing me to read at least the first Warriors book which she assures me is not too bad in the animal tragedy descriptions. We have 11 cats and a dog and I weep whenever one gets injured, sick or dies. I am puny that way! However, I read avidly with her the Patterson series “The Angel Experiment” which was fast paced and very engaging. I read it first! She read it AFTER me. We both love these 4 books (and hope for more)…and we immediately made chocolate chip cookies after we realized how “home” feeing they are in that series of adventure and major mishaps and enemies. Thank you for your blog. You are a terrific Auntie! The tragic aspect of “Warriors” is not too bad. I actually like the fact that the natural cycle of life is handled openly, from kits to elders. And the cats’ existence is centered around training and living as “warriors”, so it would be unrealistic if they didn’t get hurt badly and/or die once in a while. Another aspect of the clan life I love, and forgot to mention in the post, is the concept of medicine cats. Every clan has once, and they practice naturopathic medicine, finding herbs and other plants to heal their clanskitties. I wouldn’t try using cobwebs to patch a wound, but some of the other remedies are real. And aside from the fact that the female cats have the kits, the clan society is pretty gender neutral. Females are leaders, deputies, warriors, and male cats can also be medicine cats. Thanks again, Donna. You sound like a great grandma! Dude – I read kids books all the time. I read everything – whatever is entertaining. So you don’t feel bad about reading 18 kids books and I won’t feel bad ordering it from the library. Hi, I love warriors and I have a blog about warriors too, at my website. I’ve read the three warriors manga with millie and graystripe when they try to find thunderclan! My favorite manga out of all three mangas is the third one because that’s when mille and graystripe become mates and they find thunderclan! Erin: Thank you! I am going to put a hold on all those books at the library. I really do want to know what happens with Brambleclaw and Squirrelflight’s kits! Nick: Thanks for the comment! I was hoping we’d find out what finally happens to Graystripe. Update: I just read the first book of the latest Warriors series, “Power of Three.” I think it’s really well-done and I’m looking forward to the rest of the series. I got “Maximum Ride: The Angel Experiment” on Donna’s recommendation above, and took it with me on a beach trip that I took with Violet, Dash and Jack-Jack. Dash picked it up and read it voraciously. He said it’s the best book he ever read!